When Calgary Foothills headed to Swangard Stadium last May, goals from Daniel Davidson and Zach Verhoven gave TSS Rovers a 2-1 victory over their table topping visitors. It was the Rovers first ever PDL victory and tasted so sweet after losing twice in Calgary just a few weeks earlier. 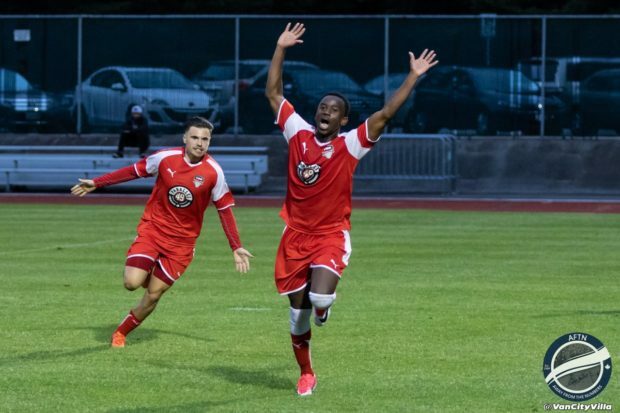 Fast forward a year and two weeks, and TSS Rovers again welcomed the table topping Foothills to Burnaby on Friday night. And again they came away with a 2-1 victory. Different season, same scoreline, but a vastly different outcome from the result. TSS Rovers are a completely different animal this year. Those first season learning on the job moments are (mostly) behind them. After a shaky start in a 4-1 season opening loss to Lane United, the Rovers regrouped and came together as a team. Working on what went wrong in that first match and immediately going about making sure they remedied it. The result is a four game unbeaten run that’s seen them climb the table. The latest of those was that 2-1 win on Friday night. A victory that saw them move to joint top of the PDL Northwest Division, kept off first place on goal difference. Soak it in. It makes for nice viewing up here. Daniel Sagno was the difference maker. 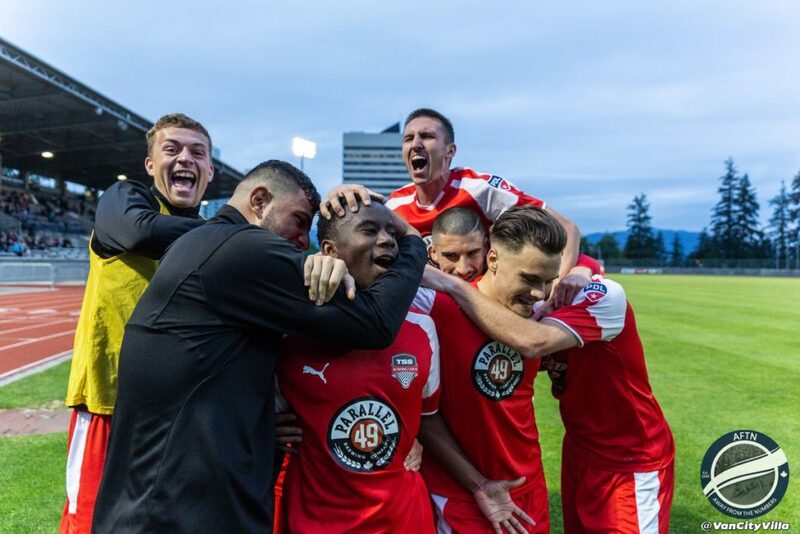 The Whitecaps Residency alumni hit a goal in each half to send TSS on their way, and even a stoppage time consolation from Calgary’s Moses Danto couldn’t dampen their celebrations on a wet evening in Burnaby. Calgary took the game to TSS from the get go, but the Rovers also had some dangerous forays forward of their own in an entertaining opening spell. Both teams had chances to score, with the visitors squandering a couple of gilt-edged chances in front of goal. They were punished on a quick counter from TSS in the 24th minute after some fantastic individual play from Thomas Gardner saw him pick up the ball deep in his own half, dance forward past four Foothills defenders, and play in his former Residency teammate Sagno. The Rovers striker showed great composure to set up the chance and finish clinically past another Whitecaps alum, Marco Carducci. It was Sagno’s first PDL goal and you could see what it meant to him and the team, and he wasn’t finished yet. As expected, TSS taking the lead led to an onslaught from Calgary before and after half time, with the Rovers looking dangerous themselves on the break. Both teams had their chances to add to the scoreline, but some resolute defending, some bad luck, and some bad misses kept TSS’ narrow one goal lead intact. As Calgary pushed they left themselves susceptible to being caught on the counter, as TSS tried to make give themselves some breathing space. They got it in the 68th minute when Carducci couldn’t hold onto a Matteo Polisi shot and the rebound fell right to Sagno two yards from goal and he gleefully fired high into the net to double the Rovers lead, capping off a fantastic night for the young striker, which also saw him put in a strong defensive shift, as he seized his opportunity to start. “We’ve told all the guys, if you don’t do it both ways you’ve got no chance of winning in this league,” Cromack told us. “This is a league where you have to learn how to win and that starts with defending and then taking your chances. Daniel took his chances and he took his moments and he did really, really well. Calgary had done everything but score as the game ticked into stoppage time, missing some glorious chances in front of goal, crashing one of the post, and flashing others inches wide. But they also came up against a Rovers defence that closed them down quickly, not allowing their dangermen any time on the ball to compose themselves to get off a shot. TSS’ gameplan and game management was almost to perfection, but they blighted their copybook slightly by giving up a goal in stoppage time after conceding a needless free kick in a dangerous position. Up stepped Danto, who was lucky to still be on the pitch after a slap on Eric De Graaf in the first half, and the striker hit a cracker through the wall and past Andrew Hick in the TSS goal. Calgary launched one last attack from the kick off and TSS gave away another silly free kick. This time they weren’t punished, however, and saw the rest of the game out to claim what could be a massive three points come the end of the regular season. Both TSS and Calgary now hold a three points lead over third placed Lane United. With the division now firmly up for grabs, as everyone continues to beat everyone else, the next few home games will be crucial for the Rovers. Those kick off on Sunday as TSS get the chance to win their first ever Juan De Fuca Plate when Victoria head to the lower mainland. Kick off is at 5.30pm, and you can get tickets at TSSRovers.com. Sunday’s match will be a double header with the women, who take on a Victoria Selects team.